On the Road..... and Then...? : Does it seem to you like I just can’t focus? 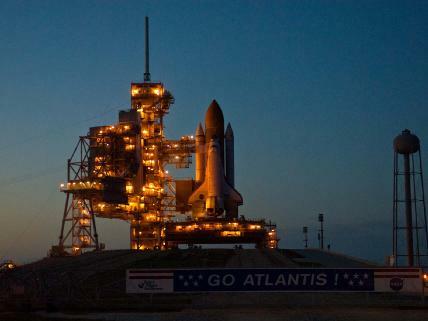 Our trip to Cape Canaveral to watch the space shuttle launch on mission STS125 is busted. Just trying to get too much crammed into too little time and to be honest, I was not nearly as excited to drive 12 hours each way within 7 days as I was to possibly see my first Shuttle launch. The primary goal was to meet our dear friends Donna and Bill, from the UK, down there but their visit to the US was just not going to be long enough to comfortably do that and be with her mother on mother’s day. The launch got moved up a day which would force them to miss Mother’s day altogether and even at that, no one really knows exactly when of the three possible launch windows on 5/11, 5/12 and 5/13 it would actually go up. It might even get postponed until 5/22 and the odds of missing it completely were just too much of a gamble for the costs. But, Merrily already had made plans to take the week off so, off we go to a closer beach, Wilmington, NC. The Wilmington KOA will not quite be the mosquito coast of east Florida but we do have our own varieties and its only 3 hours away. Did I mention how much I was not looking forward to that 12 hour drive down to Florida? Maybe the last 3 items are not absolutely gotta-do items before we go but I am sure there are more items than on this list. But, this is the master list for now and all must be dealt with before we leave on Sunday for the beach….. and just yesterday, fulltiming seemed so close! Has anyone out there seen my mind?… I seem to have misplaced it!